This small utility is intended to simplify the creation of pre-show and other music for shows run by PCStage. To use it you need to have a directory with a collection of either MP3 or .WAV files that you would like to use for your show. 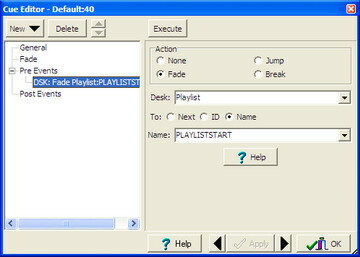 Download the file playlist.exe and place in a convenient location on your PC. Create a desktop shortcut. Start PCStage, and start the Server plugin. Use the browse button to navigate to the directory where your music is. 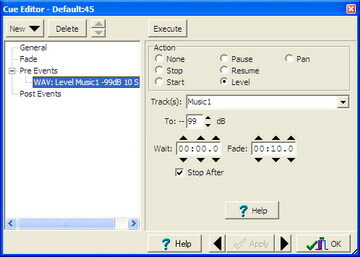 Select the format (MP3 or WAV) using the file type. Press Send to PCStage tosend the playlist to PCStage. What happens now is that a new Desk is created in PCStage, called PlayList, which is populated with play commands to play the tracks sequentially. You need to create a audio wave track called "PlayList". There are no level commands generated, so if level control is required place it as necessary. This is how I do it, normally I use the music before the show and during the interval, so I have a timed event to kick things off. At interval, do another cue with a desk event similar to the cue with the start event, but for the "To:" field chose the "Next" option rather than naing a specific cue.